You are here: Home / Providers / Dheeraj Dhotre, M.D. Dr. Dheeraj Dhotre is a board-certified lung doctor specializing in the areas of pulmonary, critical care and sleep medicine. 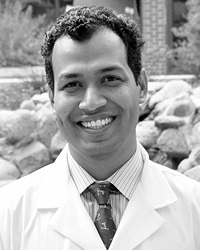 Dr. Dhotre joined Colorado Springs Pulmonary Consultants in October 2013, specializing in the newest technology. Outside the practice of medicine, he is a husband and is enjoying Colorado. He enjoys traveling and visiting his home country of India.